speaking activities are often simply exercises in vocalising grammar, as if this were all that were needed. All of those ‘Speaking sections’ of lesson spreads were (traditionally) opportunities for the learners to practise putting the grammatical components together in substitution drills and exchanges. Sure, that’s saying out loud what the lesson has been designed to ‘teach’, but it’s not speaking. By ‘speaking’ I’m referring to a spontaneous, need-driven utterance that invites an interaction. First up is this app from SpeakingPal, an EdTech company headed up by Eyal Eshed who achieved considerable success with his first company Omnivee. SpeakingPal English Tutor is a mobile application that incorporates short interactions in which the learner is required to speak with a virtual character. The app uses the EduSpeak speech recognition software that is developed by SRI International and is able to provide the learner with feedback on their productive efforts. During my time of playing with the app, the ‘feedback’ consisted of showing me which words I’d said ‘well’ (in green) and which ones I needed to work on (red). There doesn’t seem to be an explanation as to what in particular the problem is with my speaking, so I’m none the wiser as to how to improve. I just tried to shout it a couple of times to be sure. 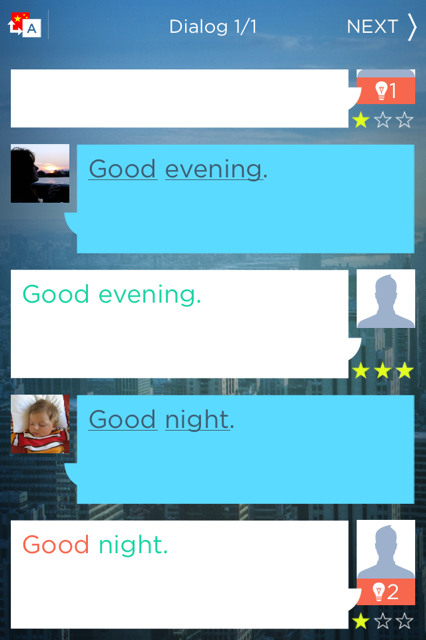 I did, in fact, get stuck saying ‘Good evening’ over and over again to the app. It became a matter of principle that I would be able to wish the app a pleasant evening and for it to be noted (if not appreciated), but there seemed to be a breakdown in communication. The absence of an actual person with whom I could establish a strategy for improving my speech was quite profound at that point; a teacher/coach/peer would be able to attempt to decode what I was saying and make concerted efforts to bridge that gap through inference. 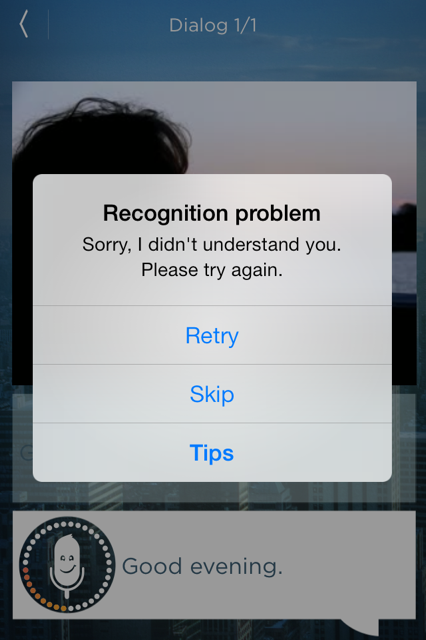 The app, however, wasn’t prepared to meet me halfway, even though I was just trying to repeat what I’d just heard. And from Cambridgeshire. The interactive exercises require the learners to select a response from preloaded options rather than to create their own answer. I’m guessing that would require some otherworldly amounts of processing power, to be fair. The issue is, again, that it’s not made very clear how you can improve and why you’re not being understood. Also, as is the case in real-time learning environments, a speaker can choose to rephrase what they are trying to say using alternative structures or vocabulary (Thornbury also refers to these adaptive strategies in the article mentioned earlier) whereas you’re locked into a very narrowly-defined response scenario with the in-app interactions. The app is undoubtedly very good at what it does; amplifying the potential that EdTech has to make language learning an entirely self-directed enterprise, a well as being mobile and affordable. It goes beyond speaking and moves the learner through various reading tasks and quizzes to boot. It’s missing out on the fundamentals when it comes to speaking practice, however; the spontaneity and support that are critical in helping a learner to recognise and respond to shortfalls in their productive abilities. I used a CD ROM years ago that did something similar to learn Japanese. It gave a waveform of your speaking next to the waveform of the model and then gave you a percentage score. The scoring seemed completely random and to depend on things like quality of microphone and background noise, but it did motivate me to pay attention to my pron and try again and again in the vague hope of working out how to improve my score, so that was some kind of success. Even more like drilling than typical classroom (semi) controlled speaking practice though. Also, is a cheaper option really necessary for most people when there are Skype lessons with teachers in the Philippines available so cheap? Thanks for the comment and for sharing your experience of using such tech. I agree that these platforms can offer a very simplified version of controlled practice. Very interesting point about the price/affordability aspect; I wonder if that Skype scenario is going to be able to compete with the immediacy and “click and download” nature of the app solution. I might need to dig a little deeper into that. Thanks for the lead! I think of Speaking Pal as pronunciation practice more than anything else. Another one that helps with pronunciation and “seeing” your grammar is Dragon Dictation. It’s not interactive, but students can speak and get feedback as to what the computer thinks they said. Sometimes students see errors more easily in written language than spoken language so there’s a nice component of error correction there as well. And I agree with you that Siri is an amazing speaking app. I think you’ve just anticipated another post in this series! Some of the most effective tech for language learning wasn’t actually intended for that application. I have had high hopes for voice recognition but I’m still waiting for it to be used well. Even a few years ago, some software just let you record your voice then score it. I currently use 2 free apps for learning French which recognises if my pronunciation is correct. the first is Babbel and the second is Duolingo. I use Babbel in BE classes with low level students and they love it. There’s no way that they would keep trying to correct their pron with me, but a tablet seems to make them more determined and they lose their shyness. I used to use English Central a lot which recognised phonemes and then compared yours to the correct ones. Students found that useful. As a teacher, I think an app that I cold set to focus on certain sounds and assess them would be good or to be able to measure stress, pausing etc. Of course, something like Babbel with longer turns would be good too, say for hotel roleplays. I’d love it to recognise their speech and say if it was right and then to offer the solution and let them pronounce it followed by correction. There are many options open but I guess we’ll see fully voice-operated tablets soon with correct dictation for notes. I hope. Thanks so much for your comment and for telling us about the apps you have used both yourself and with your learners. I was planning on looking at Duolingo next, in fact, so you have given me a bit of a head start! Thank you for reviewing SpeakingPal. This is a new version with a new design for gamification and more structured learning. As with all new things, there are some things we are still improving. The problem that you encountered seems to be a result of poor network connectivity. And please try other packages such as ‘everyday’, ‘business’, ‘travel’, etc. where the utterances are longer, making the automatic speech recognition work even better. Note that you can review your recorded utterance and compare it with a video of a native speaker after each short dialog by pressing on your picture in the script. And have you had a chance to look at the ‘sounds’ section, in which a pantomime artist demonstrates how to say English sounds ‘muppet style’? We have designed SpeakingPal with the user in mind, so every review and every comment is taken very seriously. We really do want to create an innovative product where you ‘learn with a smile’, and with over 2 million users and multiple international awards, we think that we are on the right path. Looking forward to reading your posts!